Greetings from the Country Inn and Suites, Athens, Georgia where I am part of the Game.Set.Match Tennis stringing team for the NCAA Division I Championships. There are 32 teams competing here (16 men’s 16 women’s) and right now we are stringing for 10 of them. On the men’s side, we have lined up Virginia (1), USC (5), Baylor (7), and Duke (16), and have a couple more prospects. On the women’s side, Baylor (1), North Carolina (2), Clemson (9), Duke (10), Miami (11), and Florida State (15). I arrived around noon on Wednesday the 19th. 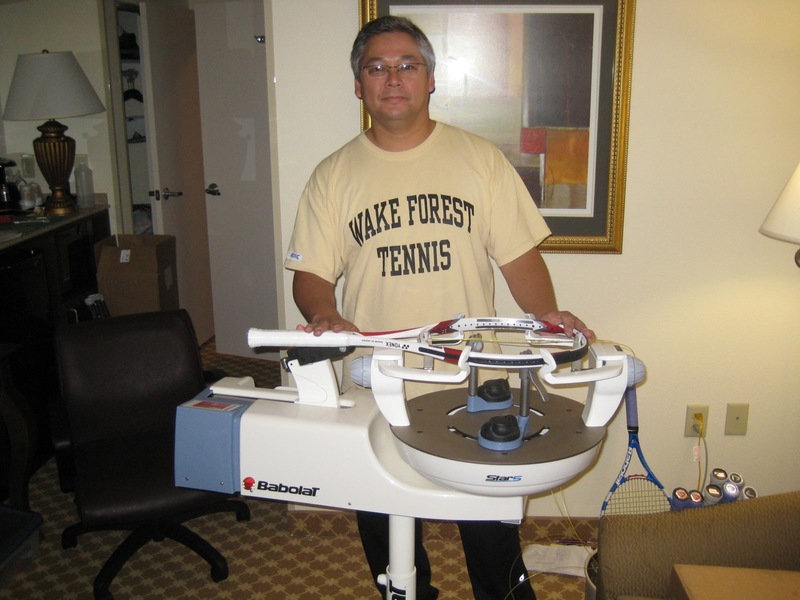 Jay Lewandowski (owner of Game.Set.Match) and Ken Kigongo already had their Babolat Star 5s up and running. I got mine out of the car and by the time I got it set up the rackets were flooding in, notably with 18 rackets from Virginia (15 Babolat Pure Drives or Pure Drive Roddicks!). As Jay was running around picking up rackets, Ken and I were grinding away at our machines. 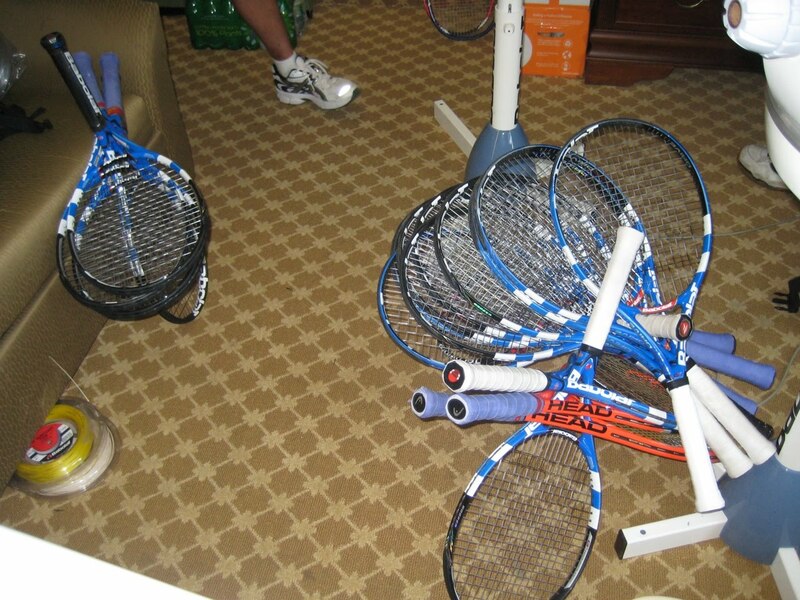 By the time we wrapped up at 11:30pm, I had strung 21 rackets (see stringing log below). In terms of string, of my 20 rackets, only 4 were hybrids and only one had no polyester string in it (female player from UNC). So, 3/4 of the rackets were all-poly. By far the most popular string was Luxilon Big Banger Alu 125. Pacific Poly Force and Babolat Pro Hurricane Tour also were strong, and we saw a little bit of Solinco (showing that their hard work cultivating college customers is paying off some). 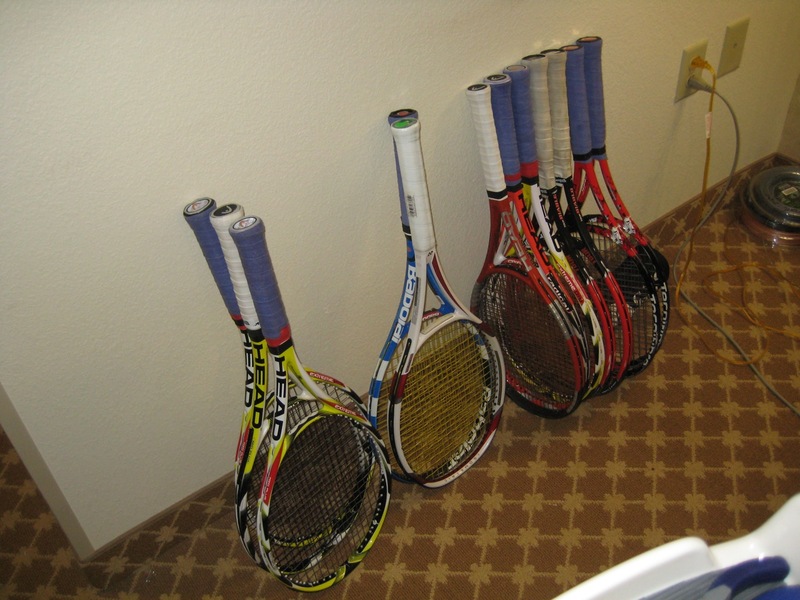 In terms of rackets, Babolat was the dominant racket in our stringing room. We saw many Pure Drives, Pure Drive Roddicks, and Pure Drive + in both the regular and Roddick versions. Many European players seem to favor Head frames — in our case Radicals and Extremes (surprisingly did not see any Prestiges). We did a few Princes, but they have clearly lost market share compared to 20 years ago. For someone who deals in smaller market share brands, I was happy to see a smattering of smaller companies like Yonex and Tecnifibre. In terms of tensions, mid- to high-50s was the norm, with some players pushing into the low 60s. No one strung in the low 50s much less the 40s. The lowest tension I strung was one Pure Drive Roddick + with Luxilon Alu at 54#. The tightest racket I strung by far was a Prince Tour Diablo with all Pacific Poly Force Xtreme at 68#. My arm hurts just looking at it. At the end of the day, I was able to look back with satisfaction at the fruits of my labor. Interesting stuff DYa. Wish I was down there. I am jealous of your job. I play tennis for Endicott College in Beverly Massachusetts. Our team string is Luxilon 16g. I personally use Tecnifibre Black Code 17g and I string at 54. 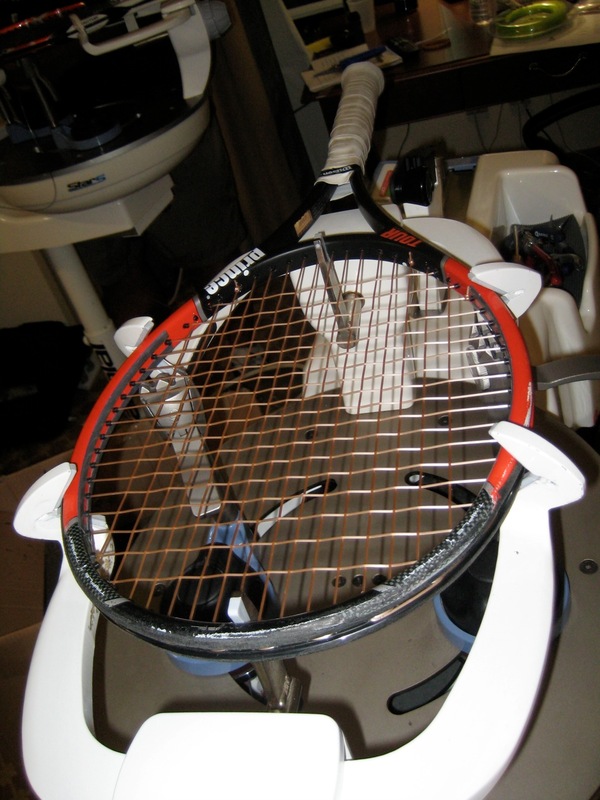 I am content with this stringing setup. Your blog is very interesting. Keep up the great stringing.